Recently a team of astronomers led by John Bochanski, a visiting assistant professor at Haverford College, began targeting stars in the Milky Way's outer halo, which is a sparse shroud of stars that surrounds the disk of our Galaxy and stretches to at least 500,000 light years away. The team has now discovered two stars in this halo that are the most distant ever discovered in our Galaxy. "It really is like looking for a needle in a haystack," Bochanski says. "Except our haystack is made up of millions of red dwarf stars." During a visit last November to the MMT Observatory, Bochanski and his team, which includes astronomers from Boston University, Michigan State University, the Harvard-Smithsonian Center for Astrophysics, and the Kapteyn Astronomical Institute, in The Netherlands, observed ULAS J0744+25 and ULAS J0015+01. They used a variety of methods to estimate the distances to these stars, but every method pointed to the same conclusion: These stars are extremely far away. They are more than 50 percent farther from the Sun than any known star in the Milky Way, or about five times more distant than the Large Magellanic Cloud. In fact, they lie about one third of the distance to the Andromeda Galaxy, the Milky Way's sister spiral in the Local Group. "The distances to these two stars are almost too large to comprehend," says Bochanski. "To put it in perspective, when the light from ULAS J0015+01 left the star, our early human ancestors were just starting to make fires here on Earth." The significance of ULAS J0744+25 and ULAS J0015+01 goes beyond their record-holding distances because they inhabit the Milky Way's halo. Some astronomers think that the halo is like a cloud of galactic crumbs, the result of the Milky Way's merger with many smaller galaxies over our galaxy's lifetime, says Haverford College astronomer Beth Willman, a co-author of the study. "Theory predicts the presence of such an extended stellar halo, formed by the destroyed remains of small dwarf galaxies that merged over the cosmic ages to form the Milky Way itself," Willman says. "The properties of cool red giants in the halo thus preserve the formation history of our Milky Way. These stars are truly ghosts of galaxies past." "It is remarkable to find stars this far out in the Milky Way galaxy," remarked Daniel Evans, lead for Individual Investigator Programs at NSF's Division of Astronomical Sciences, which funded the research. "These results will undoubtedly shed new light on the formation and evolution of our galactic home." By assembling a larger sample of distant red giants, Bochanski and his team hope to test model predictions for the formation of the Milky Way. Their results may already be putting some of these models to the test. "Most models don't predict many stars at these distances," says Bochanski. 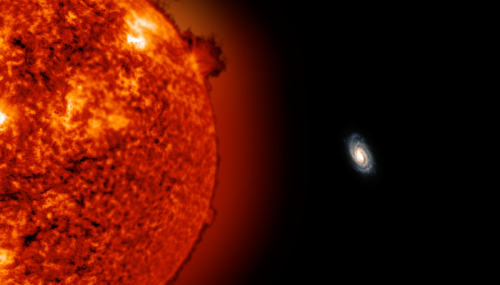 "If more distant red giants are discovered, the models may need to be revised." The search in the outer reaches of our Milky Way goes on, using the brightest stars to guide the way.